» Reviewed by Allen J. Hubin: ROBERT B. PARKER – Perchance to Dream. Reviewed by Allen J. Hubin: ROBERT B. PARKER – Perchance to Dream. ROBERT B. PARKER – Perchance to Dream. G. P. Putnam’s Sons, hardcover, 1991. Berkley, paperback, 1993. I know I should have boned up on Raymond Chandler before tackling Perchance to Dream, Robert B. Parker’s sequel to Chandler’s The Big Sleep. But I didn’t, and my reading of Chandler was so long ago I can make no comparisons. I can say that, on its own, I found Perchance a wholly delightful treat. Philip Marlowe is called back to the Sternwood mansion. General has died, but Vivian Sternwood still lives there. And her psychopathic sister Carmen, tucked away among the white coats in Sleep, has gone missing from Resthaven Sanitorium. So Marlowe goes looking. Smooth of action, full of good lines and sharp images, this went down in one satisfying gulp. Vol. 13, No. 2, Spring 1991. 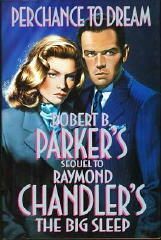 Martin Amis, who reviewed this book for the NEW YORK TIMES, offered four sentences, two authentically Raymond Chandler, the other two by Robert B. Parker. Can you tell which is which? Robert Parker did a good job of copying Chandler. Too bad his own series of novels got mired in the activities and dialog of the girlfriend, Susan and the black PI, Hawk. I hoped there would be a third and fourth Parker/Chandler outing, but he went back to Spenser’s by then tiresome dialogues with Susan and Hawk and the virtually plot-less later novels. I was no fan of the other series either, but I do give his westerns some real credit, those were fresh and new. I have to admit in Poodle Springs if I hadn’t known where Chandler ended I would not have been able to tell where Parker started.